El último ejemplar de esta obra se vendió el 15 de Marzo de 2019. Estos son los últimos ejemplares que hemos vendido. Emecé. Barcelona. 1999. 23 cm. 286 p. Encuadernación en tapa dura de editorial ilustrada. Rowling, J. K. 1965-. Traducción, Adolfo Muñoz y Nieves Martín Azofra. 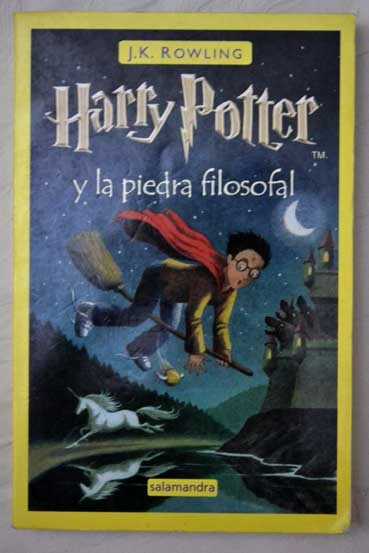 Traducción de: Harry Potter and the chamber of secrets . ISBN: 8478884955 Si desea recoger personalmente este libro en la librería, solicítelo, por favor, con 6 horas de antelación. Bloomsbury. London. 1999. 20 cm. 317 p. Encuadernación en tapa blanda de editorial ilustrada. Idioma Inglés . Cubierta deslucida. Si desea recoger personalmente este libro en la librería, solicítelo, por favor, con 6 horas de antelación. Bloomsbury. London. 1999. 20 cm. 317 p. Encuadernación en tapa blanda de editorial ilustrada. Idioma Inglés . Si desea recoger personalmente este libro en la librería, solicítelo, por favor, con 6 horas de antelación. Bloomsbury. London. 2014. 20 cm. 799 pages : map. Encuadernación en tapa dura de editorial con sobrecubierta ilustrada. Idioma Inglés. J. K. Rowling. [Harry Potter no. 5]. Harry Potter series 5. Harry Potter series ; 5. Originally published: 2003. Performed by: Read by Stephen Fry. Contents Harry Potter is furious that he is stuck at the Dursleys' house for the summer, when he suspects that Voldemort is gathering an army, and the wizarding authorities seem unwilling to do anything. Harry's so-called friends are trying to keep him in the dark. But he knows that Voldemort's forces can find him wherever he is; he could be attacked at any moment. Harry is finally rescued from Privet Drive by members of the Order of the Phoenix -- a secret society first formed years ago to fight Voldemort -- and discovers that maybe he is not alone in this battle after all . Si desea recoger personalmente este libro en la librería, solicítelo, por favor, con 6 horas de antelación. Bloomsbury. London. 2014. 21 cm. 541 pages : illustration, 1 map. Encuadernación en tapa dura de editorial con sobrecubierta ilustrada. Idioma Inglés. J. K. Rowling. [Harry Potter & the half-blood prince. ]. 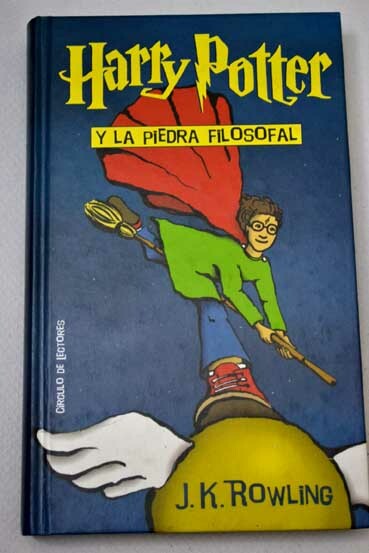 Harry Potter bk. 6. Harry Potter series ; 6. Originally published: 2005. Contents The other minister -- Spinner's end -- Will and won't -- Horace Slughorn -- An excess of phlegm -- Draco's detour -- The slug club -- Snape victorious -- The Half-Blood Prince -- The house of gaunt -- Hermione's helping hand -- Silver and opals -- The secret riddle -- Felix Felicis -- The unbreakable vow -- A very frosty Christmas -- A sluggish memory -- Birthday surprises -- Elf tails -- Lord Voldemort's request -- The unknownable room -- After the burial -- Horcruxes -- Sectumsempra -- The seer overheard -- The cave -- The lightning-struck tower -- Flight of the prince -- The Phoenix lament -- The white tomb . Si desea recoger personalmente este libro en la librería, solicítelo, por favor, con 6 horas de antelación. Arthur A. Levine Books. New York, NY. 2007. 24 cm. 759 p. Encuadernación en tapa dura de editorial con sobrecubierta ilustrada. Idioma Inglés. 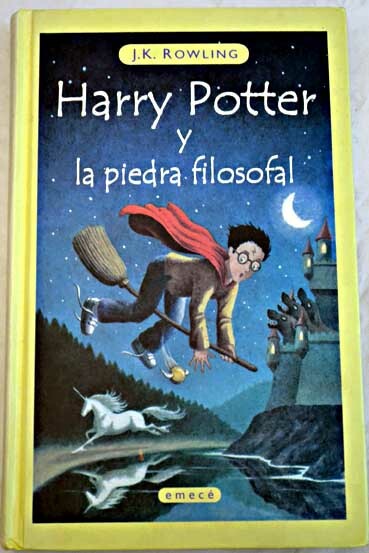 by J. K. Rowling ; illustrations by Mary GrandPre. Sequel to: Harry Potter and the Half-Blood Prince. Contents Burdened with the dark, dangerous, and seemingly impossible task of locating and destroying Voldemort's remaining Horcruxes, Harry, feeling alone and uncertain about his future, struggles to find the inner strength he needs to follow the path set out before him . Si desea recoger personalmente este libro en la librería, solicítelo, por favor, con 6 horas de antelación. Bloomsbury. London. 2014. 20 cm. 616 pages : map (black and white). Encuadernación en tapa blanda de editorial ilustrada. Idioma Inglés. J. K. Rowling. The Harry Potter series 4. Harry Potter series. Originally published: 2000 . ISBN: 9781408855683 (pbk.) Si desea recoger personalmente este libro en la librería, solicítelo, por favor, con 6 horas de antelación. Bloomsbury. London. 2014. 20 cm. 359 pages : 1 illustration. Encuadernación en tapa blanda de editorial ilustrada. Idioma Inglés. J. K. Rowling. Harry Potter series 2. Harry Potter series ; 2. Originally published: 1998. Performed by: Read by Stephen Fry. Contents The Worst Birthday -- Dobby's Warning -- The Burrow -- At Flourish and Blotts -- The Whomping Willow -- Gilderoy Lockhart -- Mudbloods and Murmurs -- The Deathday Party -- The Writing on the Wall -- The Rogue Bludger -- The Dueling Club -- The Polyjuice Potion -- The Very Secret Diary -- Cornelius Fudge -- Aragog -- The Chamber of Secrets -- The Heir of Slytherin -- Dobby's Reward . Si desea recoger personalmente este libro en la librería, solicítelo, por favor, con 6 horas de antelación. Arthur A. Levine Books . New York . ix, 435 p. : ill. ; 24 cm. Encuadernación en tapa blanda de editorial ilustrada. Idioma Inglés. "Year 3"--Spine. Sequel to: Harry Potter and the Chamber of Secrets. Sequel: Harry Potter and the goblet of fire. During his third year at Hogwarts School for Witchcraft and Wizardry, Harry Potter must confront the devious and dangerous wizard responsible for his parents' deaths . ISBN: 0439136350 (hc); 0439136369 (pb) Si desea recoger personalmente este libro en la librería, solicítelo, por favor, con 6 horas de antelación. Edilupa Ediciones, S.L . Madrid. 2006. 320 p. Encuadernación en rúst. de editorial. Traducido del Inglés . ISBN: 9788496252806; 8496252809 Si desea recoger personalmente este libro en la librería, solicítelo, por favor, con 6 horas de antelación. Bloomsbury. London. 2017. 21 cm. 127 p. Encuadernación en tapa blanda de editorial ilustrada. Idioma Inglés. J. K. Rowling . Si desea recoger personalmente este libro en la librería, solicítelo, por favor, con 6 horas de antelación.